The normally quiet - or ignored - South American continent has cropped up for the third time in a little over a week. We just covered the Summit of the Americas held in Colombia, which will most likely be remembered for US Secret Service agents cavorting in Cartagena. Earlier, we had noted that Argentina had raised a call for a return of the Malvinas (the Falkland Islands) to its jurisdiction on the 30-year anniversary of the UK wresting back control of the islands from an invasion by said Argentina. Argentina again in the news - eighth-largest country in the world by land area and the largest among Spanish-speaking nations. Its population is over 40 million people. This week, Argentina shredded amicable relations with Spain (the European nation from which Argentina maintains it received "title" to those Malvina islands, acquired when Argentina became independent from Spain itself in 1816 ...) along with confidence among many of the world's nations and institutions. It did so by announcing its intentions to nationalize assets of a foreign owned oil company, Repsol, that are operating on Argentinian soil under the name YPF. Technically, the country is expropriating (seizing) 51% of the shares of YPF, thus giving Argentina control of the company's decisions and handling of its assets and operations. As the UK Guardian newspaper put it, "Cristina Fernández de Kirchner, Argentina's president, introduced the new measure to Congress in a bid to recover sovereignty over its national hydrocarbon resources. 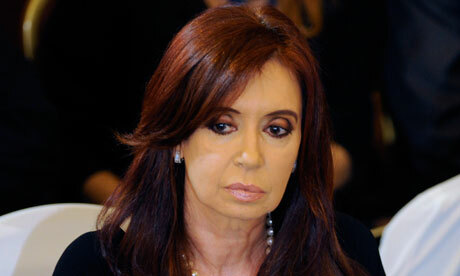 Kirchner accused Repsol of failing to produce enough oil through YPF to meet Argentina's energy requirements. Repsol's alleged failure threatened to "practically turn us into an un-viable country," Kirchner said. ... Economic and political interest in the country's hydrocarbons has rocketed since the end of last year when YPF announced it had discovered a shale oil site that could potentially yield 1bn barrels. The move to seize 51% of Repsol's YPF business in Argentina sent the company's shares spinning down 18% on Wall Street and will worry other big foreign investors such as BP." A YPF oil refinery in Argentina, on course to be nationalized by the country as soon as legislation now in the Argentinian Congress is finalized. And so we enter the murky world of global assets, financial investment, national sovereignty and when it is appropriate to break or suspend prior agreements. Any given country with a military of sufficient strength can simply seize control over facilities within its territory. The repercussions are that usually those who built the assets won't like it, and will resist through legal and/or other means. Governments can either rush legislation through the system ahead of time to give a veneer or respectability to their actions, or make the new legality retroactive, and hope that will suffice. When the action involves investors or owners of assets outside of the country - as in the case of this oil company YPF, based in Spain - seizure is usually modified and called "nationalization." "Expropriation" is another term which describes the government's recognition that there is value in the assets, and some sort of payment is made to compensate the owners for the loss of those assets. If the compensation is recognized as reasonably fair, that particular point of disagreement may be lessened, but the larger arbitrary action itself is likely to severely reduce the attractiveness of the country for further investments. And then, of course, most countries have agreed in numerous alliances and world courts that they will respect and follow a interlocking set of legal precedents and protocols for arbitrating disagreements. Nationalization (seizure of assets) is quite far down this list of accepted steps. Argentina's expropriation of YPF's assets will likely be punished by a variety of actions from the G-20 group of nations, the International Monetary Fund (IMF headquarters shown here), and the World Bank. Argentina's planned actions in this case have troubled the very nature of international relations - after all the country is not a small, shaky nation, but the second largest on the 10-nation continent. Nor is this latest announcement an isolated surprise. From a Business Week article, "[Since 2001] Argentina has been a pariah state with international creditors. At the World Bank’s International Centre for Settlement of Investment Disputes, Argentina has more disputes pending against it than any other nation." Argentina seems to be following the path vaguely similar to Venezuela's Hugo Chavez. Some observers point to a charismatic, left-leaning economist in President Kirchner's cabinet, Axel Kicillof, who stridently champion's direct government control rather than corporate control over a country's resources, unfortunately often using bellicose rhetoric to frame his arguments. As a Reuters article puts it, "Government economist Axel Kicillof stormed the world stage this week when Argentina moved to nationalize energy company YPF, defending the plan he helped devise in a fiery speech worthy of Venezuelan President Hugo Chavez. Charismatic and polarizing, the 40-year-old Kicillof lambasted "free-market fundamentalists" as he defended the push to seize control of YPF from Spain's Repsol. Just four months after taking the deputy economy minister post, Kicillof has penetrated the small circle of trusted advisers to President Cristina Fernandez, who singles him out for praise in her speeches. Sporting sideburns and an open collar, Kicillof told Congress that only "morons" would think the state was stupid enough to play by Repsol's rules and make an offer to buy 100 percent of its shares. He blasted economic theories that "justify the looting of our resources and our companies." These are not new political battles - capitalism, socialism, who directs, who controls, play out again and again on the global arena. This is just a rather abrupt eruption of the continuing debate. And it has serious consequences, as foreigners are often scapegoated for a country's troubles, and egos among leaders can do much more damage than simply being insufferable to listen to. Just look at Syria, Iran, North Korea to name three whose populations are trapped in the grip of destructive leaders.